This event took place nine months after my husband, Stephen, died of colon cancer. I was traveling with a group of six American spiritual seekers, visiting ancient and modern sites related to Celtic spirituality. On July 13, 2009, our little group drove to Kildare as part of our pilgrimage to the sites of Ireland’s three great saints: Patrick, Kevin, and Brigid, who embodied both the pre-Christian and the Christian Celtic traditions. Our first stop was a neat modern condo that serves as the home and welcome center for the Brigidine Sisters, who are an official restoration of the fifth-century Catholic Order of St. Brigid of Kildare. 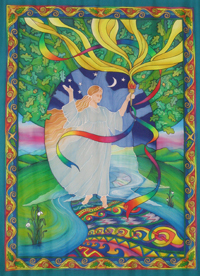 They also hold great reverence for Brigid the goddess, who is often shown bringing a rainbow light to ancient Ireland, in this case beautifully rendered in a large fabric hanging on a prominent wall of their center. They receive pilgrims from all over the world, so Sister Mary Minehan received us warmly. Gathered with my fellow travelers around a large candle in the center of her reception room, I instantly felt my spine tingle with energy as she lit the flame and began her invocation to St. Brigid. Oh, my God, I declared to myself, this woman is the real spiritual deal I’ve been looking for ever since I left home. 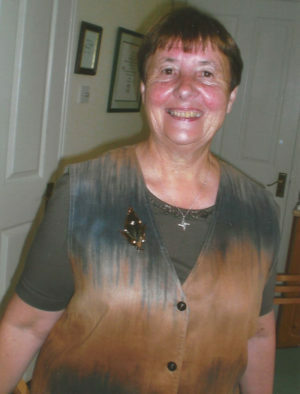 Sister Mary had been a great soul friend to John O’Donohue, the former Catholic priest and popular author, poet, and Celtic wise man who had died suddenly on January 4, 2008, two days after his fifty-second birthday. The next thing she said flew like an arrow into my heart. “When our loved ones die, they do not go away; we just can’t see them any more,” she said. “I feel John with me always.” Then she spoke of his humility and brilliant use of simple language. As our visit wound to a close, my companions thanked Sister Mary and went back to the car with mementos of jewelry and candles the Brigidine Sisters sell to raise money for the pilgrimage center they are planning to build on the outskirts of Kildare. * I hung back for a final word with this incredible woman. “Then, of course, your heart is fractured, isn’t it?” Sister Mary said, looking at me with immeasurable tenderness. “But he’s not gone, you know,” she smiled. 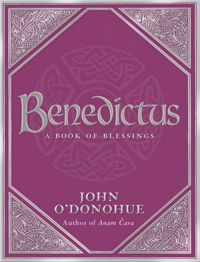 “He’s right here.” Pulling a copy of Benedictus from her shelf, she said, “Let me read you the blessing John O’Donohue wrote ‘On the Death of the Beloved.’” She read several passages, ending with an invitation to the departed to be with us until we meet again in a place where we will never be separated or alone. We smiled deeply at each other. Sister Mary enfolded me in her arms; and, with the simplicity of a hug, she took away my pain. Excerpted from A Beautiful Death: Keeping the Promise of Love, p. 245-248. * The Solas Bhride Centre & Hermitages opened its doors in 2015.